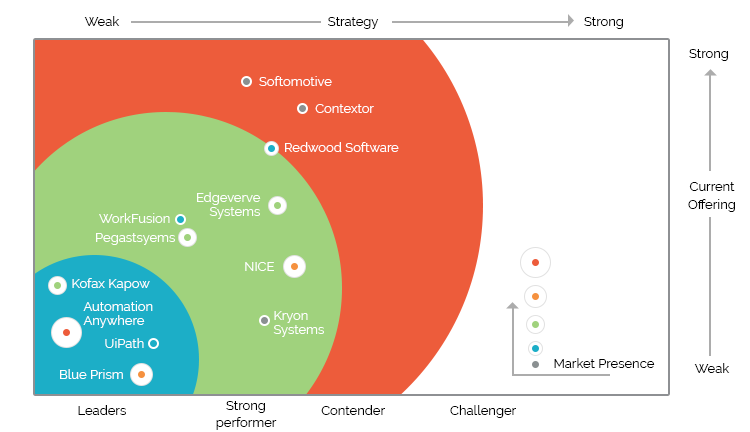 Robotic Process Automation has created a great deal of buzz in and around the technology space. The main aim of RPA is to let the bot do the tasks which are easy, repetitive and documented such that going with the rules even a bot able to complete the task. 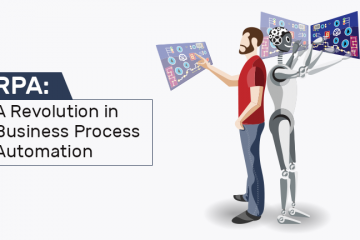 Before developing any such software and robot, selecting the proper RPA tool is a crucial thing in the automation journey. It can directly impact the outcome of an RPA implementation. 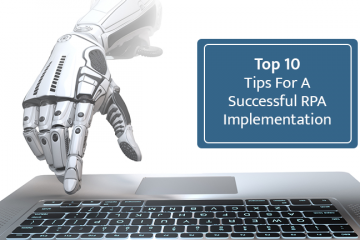 In our last blog, we have already discussed RPA benefits and how the enterprise can use it to their best, here in this blog we will talk about top RPA tools and their core functionalities. 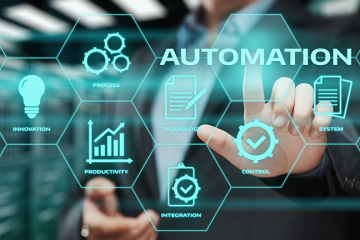 Even before Robotic Process Automation came into the picture, enterprises were using automation tools for processing tasks with simple hacks, excel automation, and macros. They were not scalable or reliable still they increased the productivity of employees. Built as the extension of the past generations of bots, here are 3 main categories of RPA tools on the market. Programmable RPA bots: Programmers need to understand and code a set of inputs governing how the RPA bot will interact with other systems. It was the first generation of RPA tools. Self-learning solutions: These tools witnessed hours of human employee activity, understood the process and then took over the platform and started performing the same task. Cognitive/intelligent automation bots: Cognitive automation bots are augment self-learning bots with advanced functionalities (like Natural Language Processing, image recognition, and machine learning) which can learn and deal with both structured and unstructured data. A bot should able to interact with various other systems either through screen scraping / API integrations. A bot should able to make decisions and find its actions based on inputs gathered from other systems. The graphical representation is according to Forrester Wave report: Robotic Process Automation, Q2 2018. There are some appreciated RPA vendors providing their own tools to automate business processes. However, here we are discussing the top 5 RPA tools which will help you to streamline the selection steps. Kofax Inc. is a process automation software provider based in Irvine, California. They offer process management, RPA, e-signature, mobility and customer communication services to multiple customers in 70 countries worldwide. Kofax Kapow is the most efficient way to acquire, enhance and deliver information from any application and data source or enterprise system without coding. It supports all types of application environments and data sources, including websites, portals, enterprise systems, and legacy applications, Excel, Email, XML, JSON, CSV, and SQL. It can automatically publish robots with standard Java, .NET, SOAP, RESTful interface which is used to control robotic processes from external applications and remote systems. Blue Prism group is a multinational software organization based in the UK. They pioneered RPA to reduce the high risk and low return processing work and data entry job manually. The technology used is based on Microsoft.net framework and it supports any type of platform and applications. It allows the design automation process that too within IT governance. The tool supports the internal and external decryption and encryption keys. The users are provided with audit logs enabling. The customized code of .NET provides a high rate of robustness. UiPath is a global software company based in New York City. 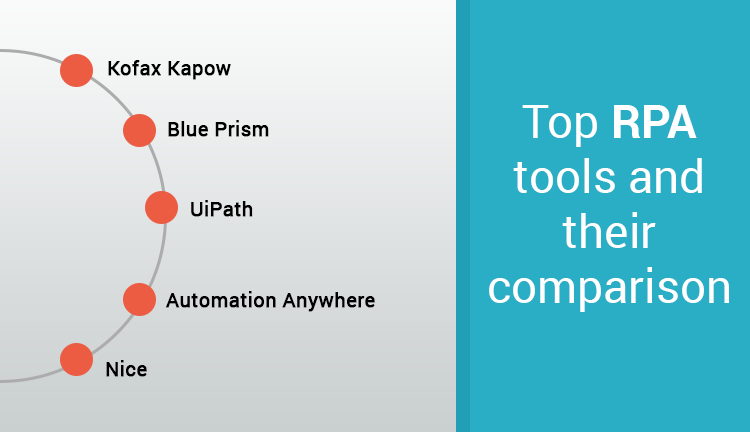 With the help of UiPath tool, it is easy to manage automated business processes and the virtual workforce. It is based on an on-premise and cloud deployment method which makes it capable to deploy and manage all things in one particular place. The main advantage of UiPath is that it offers desktop contribution and Citrix environment which is good for BPO automation. It is based on Microsoft SharePoint workflow, Kibana elastic search. Automation Anywhere is based in California, US. It caters to businesses looking to deploy a digital workforce composed of bots which can offer complete end-to-end business processes. Be it cloud, datacenter or desktop, automation anywhere can be deployed in any environment. It can protect all the architectures and control the processing. Microsoft is its base technology. Neptune Intelligence Computer Engineering which is commonly known as NICE is a publicly traded software company based in Israel. It enables enterprises to operationalize Big Data. It delivers both desktop and server automation, so employees can focus on productivity. It can also automate cross-application processes by combining with any third-party or home system, including CRM, billing, MS Office, virtualization, and networking. 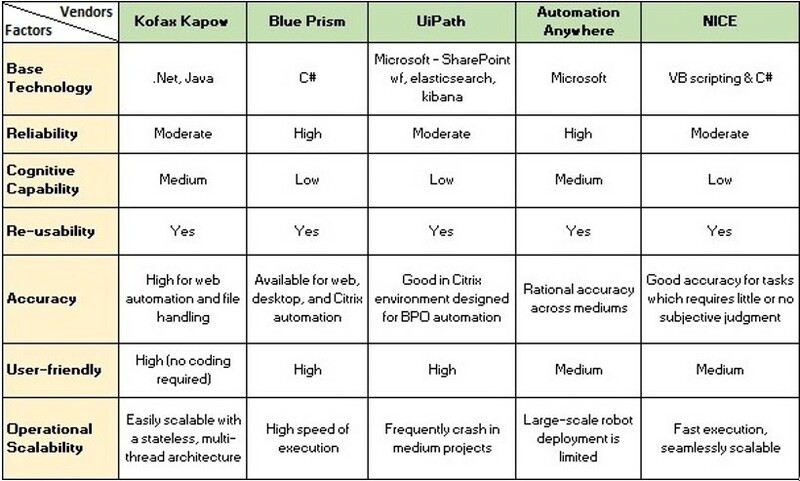 Summary Table / Checklist for selecting RPA tools. Each RPA tools come with unique features to support business automation. Kofax Kapow has great potential. It is a highly user-friendly IDE which allows developers to build robots more efficiently. It allows large-scale robot deployment where the user can easily schedule a robot to run at a different time. As it supports a multi-threaded environment, it can run multiple robots at the same time. Before considering any of the above-mentioned tools, you have to thoroughly scrutinize which will be best suited for your business automation. You will need an appropriate roadmap to RPA. Are you planning to implement RPA in your business process? Over the years we are helping enterprises to make about 25 to 50% cost savings, to improve the accuracy and efficiency of the process execution and to cut human intervention. We offer end-to-end delivery and maintenance services with flexible support from product specialists. Come talk to us today, for a free consultation, Contact Us.